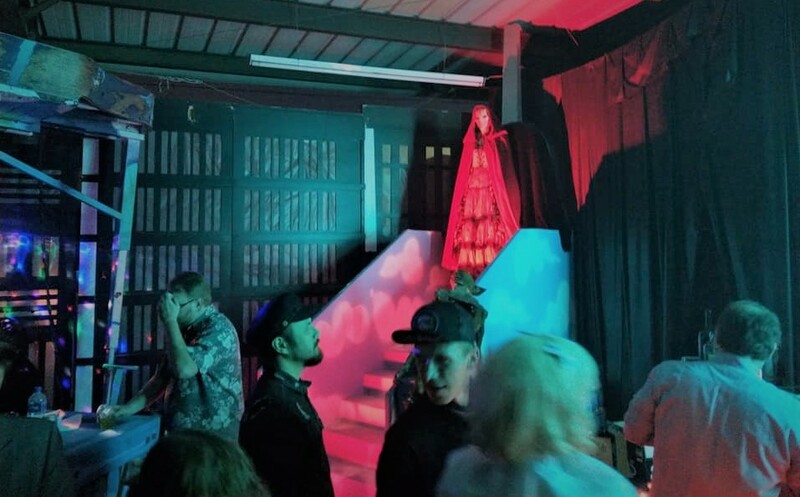 Over the last decade, perhaps in response to competition from the big Halloween theme park attractions, there has been a trend among the smaller Halloween events in Los Angeles - a trend toward morphing these haunts into "destinations." The proprietors do not want you to show up, walk through their spooky maze, and then leave; they want you to hang out for a while and spend some more of your money. To that end, Halloween haunted houses & hayrides are frequently surrounded by souvenir booths, psychic fortune tellers, food stands, perhaps even rides and stage shows - all designed to create an attractive destination, an inviting place where you can stay and enjoy an evening's entertainment after screaming your way through the "Corridors of Blood" or whatever the main event is called. The FrightFair Screampark has been at this game as long as anybody: even before expanding into the annual Halloween Harvest Festival a year years ago, FrightFair had offered simple rides (such as bungee swings) to those attending its terrifying haunted house. In 2005, FrightFair's Halloween Harvest Festival began offering such kid-friendly activities as a giant slide, jumpers, a petting zoo, a train ride, a carousel, ponies, bumper boats, a corn maze, and a stage on which various shows were performed. The combination provided a great place for parents to spend an afternoon or an evening with their children, but it was not necessarily something that would keep fright-fans hanging around after dark. Well, that all changed on October 1, with the advent of Ben Von Strawn's Monster Party 2 - an all-day charity event (benefiting St. Jude's Children's Hospital) that took place on the Harvest Festival grounds at Pierce College in Winnetka. The layout of the festival has been expanded to accommodate more booths, where sellers can hock their Halloween-oriented good and services, ranging from terrifying t-shirts to ghoulish glitter tattoos. Artisans showed off such impressive work as a functional bicycle whose frame resembled a giant spiderweb. Butch Patrick (Eddie in the original version of THE MUNSTERS) signed autographs. A line of sporty-looking, customized hearses stood nearby, eliciting understand admiration from viewers. Bands such as White Coffin and The Dead Terrror blasted out music from the stage. Costumed Jedi Knights and Sith Lords gave demonstrations of light sabre duels. It was a bit like being at a mini-convention, withe a fun, free-wheeling atmosphere filling the air. In short, for the first time, we found ourselves enjoying a Halloween haunt for its extra-added attractions, not just for its main event. 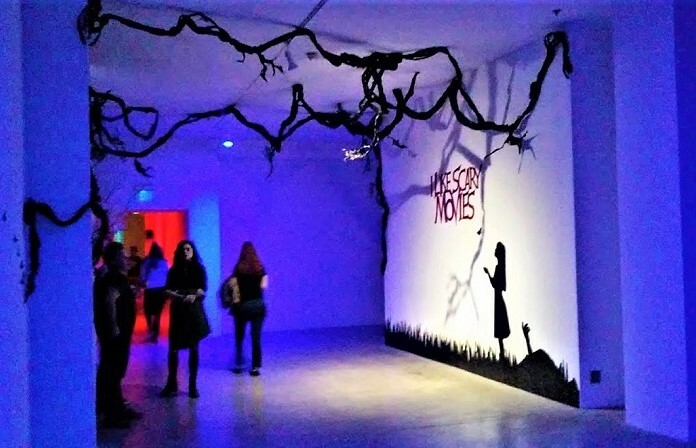 Instead of flitting like a bat to FrightFair's three Halloween walk-throughs (The Factory of Nightmares Haunted House, the Insane Reaction Maze, and the Creatures of the Corn trail), we wandered among the booths, talking with guests who shared our love for the macabre. Less than 100 yards from Charles booth was FrightFair's Factory of Nightmares, which more than a few scary clowns, including one that is obviously based on a design seen in KILLER KLOWNS FROM OUTER SPACE. So we had to ask whether the Chiodo Brothers receive any royalties from these funhouse-style Halloween haunts, and the answer was no. 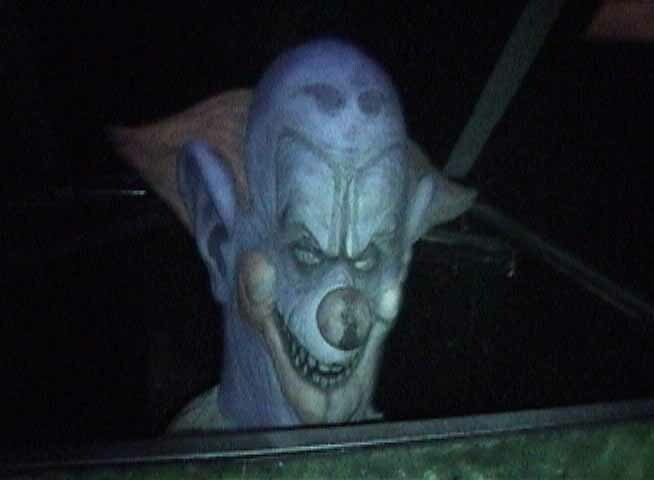 Chiodo also took issue with a claim I had heard from someone who used to work at the Knotts Berry Farm Halloween Haunt: namely, that Knotts Scary Farm had introduced the concept of killer clowns years before the release of the Chiodo Brothers' movie. Charles Chiodo admitted that some scary clown mazes might have pre-dated the 1985 film, but pointed out that since then, these Halloween attractions have adopted the exaggerated, stylized look of KILLER KLOWNS FROM OUTER SPACE. More than that, they have adopted the spelling with the letter "K" (as in "Killer Klown Kollege," which appeared at Knotts Scary Farm in 2007). The world of Halloween haunts definitely owes the Chiodo Brothers a huge spiritual debt, even if there were a few demented carnival maniacs before 1985. Unfortunately, we could not tarry longer; the opening night reception for October Shadows IV beckoned to us from across town (where, coincidentally, some of artist Ben Von Strawn's paintings are on display). And so we bid farewell to the Monster Party. If nothing else, the evening convinced us that Halloween attractions can truly be desirable destination spots, not merely places you visit like a thirsty vampire and then quickly leave, in search of the next drop of blood. Hopefully, the Halloween Harvest Festival can maintain the party atmosphere throughout the month of October. For ourselves, we trek to the Halloween Harvest Festival every year to savor FrightFair's fearful delights. Assuming Ben Von Strawn's Monster Party 3 materializes there in 2012, that is definitely the night we will attend. The Halloween Harvest Festival continues through October 31. Hours are 10am to 10pm on weeknights, to midnight on Fridays and Saturdays. ; night-time FrightFest Hours start at dusk. The address is 20800 Victory Boulevard in Winnetka (the official website indicates Woodland Hills, but Google Maps identifies the address as Winnetka - which yields better results when you plug it into your GPS.) The official website is here.